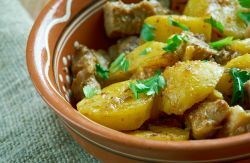 Lithuanian cuisine is meant to keep you warm in the cold climate, relying upon hearty foods such as potatoes, rye bread, meat and dairy products. 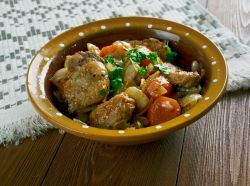 Fish recipes can be found in seaside areas, but pork is the meat of choice, followed by beef and chicken. Cepelinai (zeppelins): The national dish of Lithuania, originally called didzkukuliai but changed in the 20th century because of their resemblance to zeppelin airships. 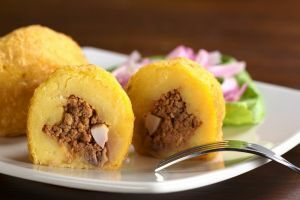 Cepelinai dough is made with potatoes, and the filling is pork with sour cream and bacon sauce. Vegetarian versions are also available. 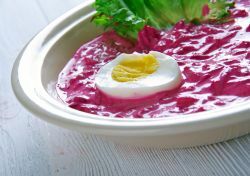 Saltibarsciai: A chilled borscht accompanied by hardboiled eggs and boiled potatoes, served in warmer weather and notable for its bright pink color. Kepta duona: Dark rye bread fried in oil, seasoned with garlic and salt, and served with cheese sauce. Potato pancakes: Many variations are found throughout Lithuania, including meat-filled and vegetarian versions. Fried cheese curds: Typically served with fresh berries and jam, a staple in Lithuanian households. Kugelis: Baked potato pudding or lasagna with or without meat and served with lingonberry jam, bacon, or sour cream. 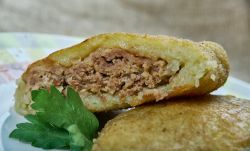 Kibinai: Hand pies filled with meat, vegetables, cheese curd, or jam that are the national dish of the ethnically Turkic Kariate people who live in Lithuania. Sakotis: Similar to German Baumkuchen, it is a cake composed of a large, hollow ring with branches around the edges formed by batter dripping as the cake is cooked like meat on a spit. The most common alcoholic beverage is beer, with national brands making up 90% of those sold, and there is no wine-drinking tradition in Lithuania. Vodka is typically associated with the lower classes, and gira is a mildly alcoholic soft drink that is less popular than Western brand sodas. 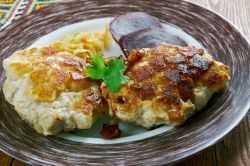 Latvian cuisine shares some similarities with its Baltic neighbors, including an emphasis on hearty fare such as dark rye bread (rupjmaize in Latvia), pork steak, and dumplings. 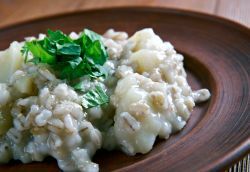 Traditional recipes and local ingredients continue to play a large part in contemporary Latvian dining. Pelēkie zirņi ar speķi (grey peas and speck): The national dish of Latvia, a stew made from a local variety of dried pea, mixed with fried onion and diced speck, a type of fatty smoked bacon made from pork belly. Usually served at Christmas, as peas are thought to bring luck and money, but found year-round on menus throughout the country. Pelmeni: Russian dumplings filled with minced meat, vegetables, and cheese, served in a broth or fried and eaten with sour cream. 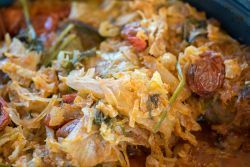 Sauerkraut and pickled vegetables: A Latvian staple found in side dishes, dumplings and soups. 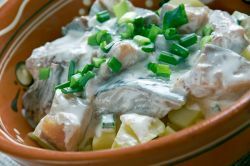 Rasol: Potato salad similar to the Russian Olivier salad, composed of layers of meat or herring, hard boiled eggs, vegetables, mayonnaise and sour cream. Maizes zupa (rye bread pudding): Traditional dessert made from sweetened rye bread, apples, cinnamon, cranberries, raisins, plums, and whipped cream. Beer is the most common alcoholic drink here as it is in Lithuania, since grapevines can’t withstand the Northern climate. Black Balsam is popular a Latvian vodka-based liqueur, supposedly first brewed to cure Catherine the Great of a stomachache when she was visiting Riga. Bitter and herbal, it is prized for medicinal and recreational purposes alike: to make it more palatable, it can be drunk with blackcurrant juice or mixed in a cocktail. 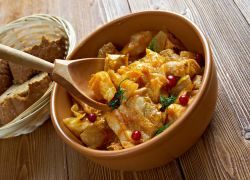 Estonian cuisine values local production and fresh ingredients such as homemade rye bread, pork, dairy, and blackcurrants and chanterelle mushrooms harvested seasonally from the forest. 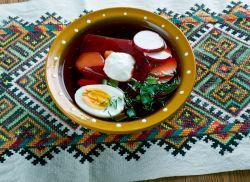 German, Russian, and Nordic influences have shaped Estonian dining culture, and the country today embraces new culinary innovations while remaining loyal to traditional mainstays. Fish: Baltic herring is the national fish of Estonia, and white fish, flatfish and perch are also widely popular. 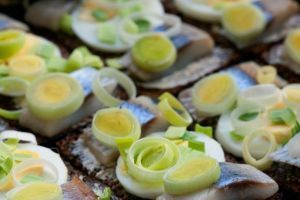 Another member of the herring family is the sprat; as the Baltic Sea is full of them, they can be found in numerous dishes including kiluvõileib, a sandwich of dark bread, sprat, boiled egg and sauce, eaten for centuries. Mulgipuder: Mashed potatoes mixed with groat and butter, served with bacon sauce. Aspic: Pork jelly filled with vegetables, fruits, and pieces of meat. Kama: A mixture of roasted barley, rye, oat and pea flour, used as an ingredient in desserts or mixed with buttermilk or kefir and eaten for breakfast. Kohuke: A popular snack of sweet curd covered in caramel or chocolate. Verivorst: Blood sausage, usually eaten during Christmas. Chocolate: Kalev is the oldest and most beloved chocolate factory in Estonia, producing high-quality confections. 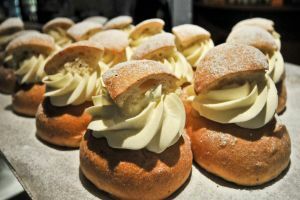 Vastlakukkel: A common dessert made from a wheat bun stuffed with whip cream. Fruit and berry wines are made at home as well as commercially, and kvass is a traditional fermented beverage made from rye bread. Beer is a historical favorite, and a uniquely Estonian liqueur is Vana Tallinn, used often for flavoring desserts or mixing with coffee.